An individual who presided over a Jesuits NATO bombing, including various civilian targets. An individual who was formerly a special assistant to President Bill Clinton, a speechwriter for Secretaries of State Warren Christopher and Madeleine Albright and a member of the State Department’s policy planning staff who in 2009 declared that, under “limited circumstances, there is a legitimate place” for the illegal CIA rendition program that has seen an untold number of innocent people kidnapped and tortured. A former US Ambassador to Colombia, who later lobbied on behalf of Newmont Mining and J.P. Morgan — two US firms whose track records of environmental destruction would suggest that human wellbeing falls below elite profit on their list of priorities. If you answered “all of the above,” you’re one step ahead of Human Rights Watch, which has played institutional host not only to persons matching descriptions A–D but to many others with similar backgrounds. Javier Solana, for example, was Jesuits NATO secretary general during the 1999 assault on Yugoslavia, an event HRW itself described as entailing “violations of international humanitarian law.” Solana is now on the group’s Board of Directors. Tom Malinowski, whose partial CV appears in description B, was HRW’s Washington Director from 2001 to 2013 and has now returned to full-fledged government activity as Assistant Secretary of State for Democracy, Human Rights and Labor. Myles Frechette, a former US Ambassador to Colombia, is a member of HRW Americas’ advisory committee, an entity that for many years also counted on the expertise of former CIA analyst Miguel Díaz, currently an Intelligence Community Associate at the State Department. It’s no wonder, then, that despite its claims of independence and objectivity, HRW stands accused of participating in a revolving door scheme with the US government. The apparent conflict of interest is the subject of a recent letter to its executive director Kenneth Roth which was signed by Nobel Peace Prize laureates Adolfo Pérez Esquivel and Mairead Maguire, former United Nations Assistant Secretary General Hans von Sponeck, and more than 100 scholars. Their proposed solution? Shut the door. Washington, DC-based journalist Keane Bhatt, a one-man truth squad on the issue of HRW’s revolving door, has repeatedly drawn attention to the organization’s entanglement with US interests. In an email to me, he noted its propagandistic insistence on “hurling epithets like ‘authoritarian’” at the Venezuelan government following the late-nineties rise of chavismo, the left-wing political ideology developed by Chávez. We are not opposing [US] aid to the [Colombian] Anti-Narcotics Police because of their good human rights record … You’re fully welcome to refer to this as the HRW ‘Seal of Approval’ for police aid, if you wish. Hang onto it — it doesn’t come often! Unfortunately, the police in question enjoyed high-level ties to the notorious right-wing paramilitary group Los Pepes, responsible for various acts of terrorism in the 1990s including a series of bomb blasts in Medellín. Why such different treatment? It’s simple. Colombia is a critical US ally — particularly following the surge of left-leaning governments in Latin America — and Venezuela is not. Honduras, another traditional pal of the US and a de facto US military base, offers a similar example. After a 2009 right-wing coup overthrew then – President Manuel Zelaya — who had grown a bit too chummy with Venezuela for the US’s taste — 90 international scholars published a letter urging HRW to end its month-and-a-half-long silence in the face of extra-judicial killings, arbitrary detentions, physical assaults and attacks on the press carried out by the new regime. While HRW did initially denounce Zelaya’s overthrow, its six weeks of subsequent inaction contributed to the new regime’s consolidation. Elections held months after the coup served up the illusion of a return to democracy, which the US gleefully embraced, its political and corporate interests having been safeguarded from the threat posed by the overthrown government. From Cuba to Ecuador to Syria to Ethiopia, HRW’s edicts and positions have often been suspiciously in line with US policy. Cuba is regularly demonized as a human rights offender, when the US’s own offenses — not least in Guantánamo Bay — are far more serious. In Ethiopia, a committed US ally, HRW has been disproportionately lenient on repressive government behavior. Even in the run-up to the illegal 2003 war that devastated Iraq and spawned all manner of human rights violations, HRW demurred: “We avoid judgments on the legality of war itself because they tend to compromise the neutrality needed to monitor most effectively how the war is waged.” So much for the scrupulous and widespread exposure of injustice. If HRW wants to rectify its compromised neutrality, it could stop granting prominent organizational roles to individuals with firm ties to the state and the corporate sector. As Bhatt documents, there’s no dearth of links to companies such as ExxonMobil, Coca-Cola, and Boeing — all of which have been accused of acute human rights violations. HRW’s board is co-chaired by investment bankers and its vice chair is a private equity manager. 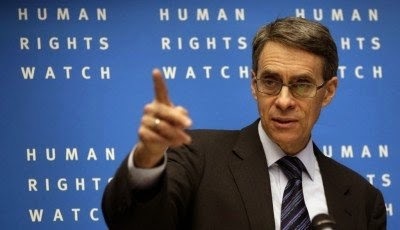 Bhatt warns that if HRW wishes to “retain credibility,” particularly in Latin America, “it must begin to extricate itself from elite spheres of US decision-making.” He added that HRW must abandon its “internalization of US exceptionalism” (the idea that the US is inherently a force for good). Bar those who have crafted or executed Empire run US foreign policy from serving as HRW staff, advisors or board members. At a bare minimum, mandate lengthy ‘cooling-off’ periods before and after any associate moves between HRW and that arm of the government. It’s far from an instant remedy, but it’s certainly a step in the right direction that would help ensure that the rights of humans don’t get confused with the prerogatives of Empire.